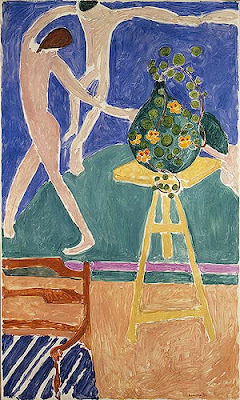 Happy last day of the 2011 year, dear reader, and Happy Birthday to Henri Matisse, who was born 142 years ago today, in 1869. He died on the third of November in 1954, but it is Matisse's life that we (the 80+ things which I grow in my urban — NYC — garden) and I are recalling today. Henri Matisse is credited with many paintings, and the one pictured above, Nasturtiums with the Painting Dance, is not only a favorite of mine, but it is one that all 80 + things that I grow in my rooftop garden enjoy. Hence, it is the general consensus of the things which I grow in my garden, and I, that we include it, and give a shout out to Matisse himself on this December the 31st; the last post for the 2011 calendar year. However, as much as I enjoy the work of Matisse, I had intended the last post of the calendar year for TLLG to be a year-in review re my urban garden. As you may recall, dear reader, I expressed this intent the last time I posted on TLLG, which was December 28, 2011. But, since the hour to raise a glass and toast 2012 is drawing near, and I don't want to end 2011 without a post, I have switched gears — on the advice of the things that I grow. The truth is I have had some production glitches (although not the magnitude of glitches that were experienced in getting the $70 million musical, Spiderman Turn Off the Dark, under way), and so my year-end review will take place at the beginning of the new year — something Charlie Rose and Barbara Walters would probably find unthinkable, as they always put every given year into succinct capsules; highlighting this and that, before the onset of a new year. What happened with me is this: I found out, in compiling my film clips for my year-end review, that when you grow 80+ things in a garden, there can be some bickering on the "film production set"; they all want to be in the opening scenes! This should have come as no surprise to me, given the feelings my Actinida kolomikta and Actimida (Kiwi Vines), expressed during their roles as the narrator of my first garden themed movie, The Kiwi Speaks! Fifteen Minutes of Fame . . . almost. And if you'd like to see my first endeavor, you can find it within my Vimeo Library with my other virtual stories. The aforementioned movie is now considered a virtual story, and I subsequently have been producing virtual stories for clients (that, in addition to garden themes, cover an array of topics of their choice such as vow renewal ceremonies, memorials and product promotions). Moreover, ever since the great response I have had regarding The Kiwi Speaks! Fifteen Minutes of Fame . . . almost, all the things I grow have wanted to star in the movies AKA Virtual Stories that I produce. Their need to be on camera is one that I myself am quite over, having been there and done that, in my brief stint as an actress in the film industry, which has been mentioned on TLLG in posts that can be found by clicking here as well as here and here. But, meanwhile, back to this final post of the year, and how Matisse became part of the mix, here's the back story: Since everything that I grow appreciates the talents of Henri Matisse, and since Matisse liked to paint nasturtiums AKA Tropaelum majus; every one and every thing agreed that my first aspect of the 2011 year in the urban garden shoild feature my Tropaelum majus — providing I promised to give all the things I grow their own year in review which I will do within my first several follow-up Friday segments of the new year so stay tuned for this exciting feature. And now without further ado, in honor of Henri Matisse and of my 2011 Tropaelum majus (Nasturtium) here is the slide show, which will hopefully bring some joy to you dear reader, on this last day of 2011, before you head out to ring in the new year . . .
. . . and in the interim — after you watch my slide show of my Tropaelum majus — and find yourself curious about this amazing plant, you may want to read more about it. To do so, please click here for a link to take you to related posts on this blog. I have also included information about my Tropaelum majus on nybg's (New York Botantical Gardens) tumblr which you may access by clicking here and typing your topic of interest within the search field. ------ See you next year! Have yourself a . . .
Friday Follow Up: "the celebration of Festivus"
Friday Follow Up: "the reindeer effect"
Rockin' around the Hens and Chicks! Oh, Wednesday's Wisdom, Where are you? "Threescore men and threescore more . . .